Safety is one of the most important features of rehabilitation robots. However, strategies for safe rehabilitation robots are not yet clarified. A basic strategy for safe industrial robots is isolation, which cannot be applied to rehabilitation robots because they must work near or in contact with humans. This problem has been discussed in a special committee of the Japan Robot Association according to ISO and new safe strategies for rehabilitation robots were proposed: considering tolerable risks on account of their benefits, a declaration to apply “state-of-the-art” technologies to them, informing users of the residual risks and procuring users’ consent for their use. According to the proposal, not only inherently safe rehabilitation robots but also highly beneficial robots with relatively low risk can be acceptable. As both the MANUS and Handy-1 system use low-power actuators for inherent safety, they can move very slowly and handle only light loads. 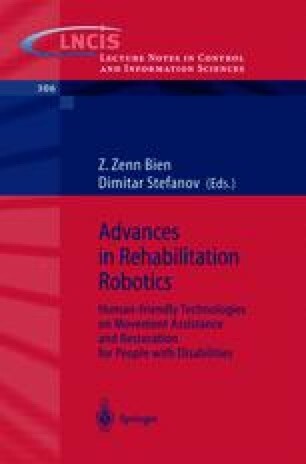 However, rehabilitation robots with higher performance can be developed according to these new strategies. In this paper, risk reduction mechanisms for rehabilitation robots with powerful actuators are discussed.